Hoosier Gym is displayed in this file photo. A historic gym in eastern Indiana that was featured in the 1986 basketball film "Hoosiers" needs a new roof, brick repairs and new windows. 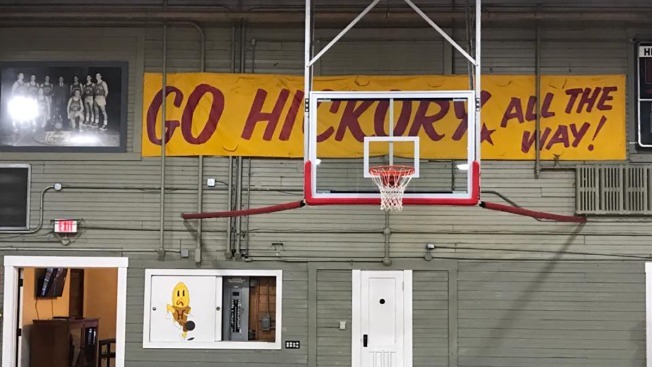 The Hoosier Gym, a rustic, 1920s-era structure in the farming town of Knightstown, served as a functioning gym until the mid-1960s, WISH-TV reported. It's now used as a community center where kids play basketball, said Bob Garner, events coordinator at the gym. The facility serves 70,000 people a year, including visitors from foreign countries, he said. Many upgrades are needed to keep the gym in pristine condition, Garner said. "We need a new roof, we need tuck pointing of the bricks outside, and we need new windows," he said. "If anything happened to that roof, this gym would be gone." "Basically the maximum would be $500,000," said Dr. Neil Shaneyfelt, who is the president of the board of directors. "That sounds like a lot of money, but an old building like this to put on a roof, replace 31 windows, and point and tuck the brick. And we have to match 20 percent of that." The gym served as the home of the Hickory Huskers in "Hoosiers," which starred Gene Hackman and Dennis Hopper.